With its excellent sound quality, the Welch Allyn Elite helps you to hear more of the sounds you need to hear and less of what you don't. Using its two-position frequency selection switch, you can listen to either high or low frequencies to easily pick up low diastolic murmurs or high-pitched pulmonary sounds. 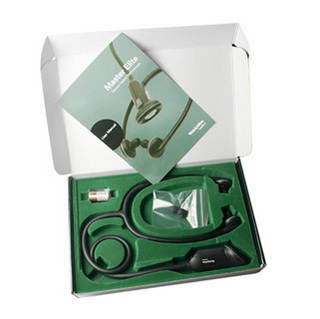 In addition, accessories can be purchased that electronically capture, record and distribute body sounds or allow multiple users to co-listen, making the scope perfect for teaching or consult situations. Two-position filter switch lets you listen to high or low frequencies. Adjustable binaurals and eartips ensure all-day comfort. Long-life lithium ion battery lasts up to 140 hours. Optional Distributor allows others to hear simultaneously. Optional Analyzer stores and analyzes the sounds you hear right on your PC. Click the button below to add the Welch Allyn Elite Electronic Stethoscope to your wish list.